Food tour! It’s one of the first things Tom and I do soon after we arrive at a new destination, to get our taste buds working to the rhythm of an unfamiliar food culture. 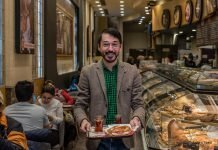 In the case of Morocco, the food is not new to us—we have been coming to Morocco often for more than a decade—but we know Moroccan food as it is served in Fez, where we have a home in the medina. Last month, though, we spent a few days in Marrakech. 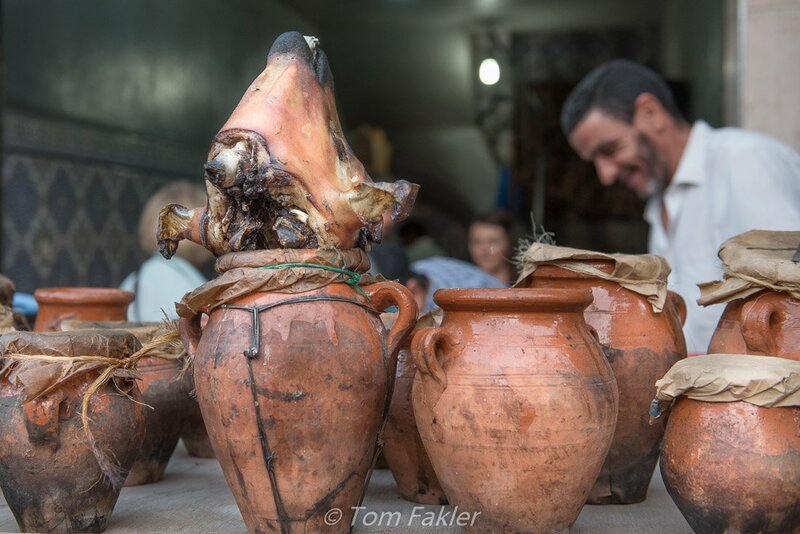 There, we had an opportunity to take a Marrakech food tour. Our guide was Youssef Moutaki, who with his American wife Amanda, founded Marrakech Food Tours, a popular food tour company, a few years ago. Their local perspective has been invaluable in creating food experiences that are based on the foods Moroccan people eat, at home and on the go. What we found was a local food scene that is much larger than the sum of its parts. Our walk began on the edge of Djemaa El Fna and plunged straightaway into the streets of the medina, where street food and tiny restaurants feed locals as well as tourists. 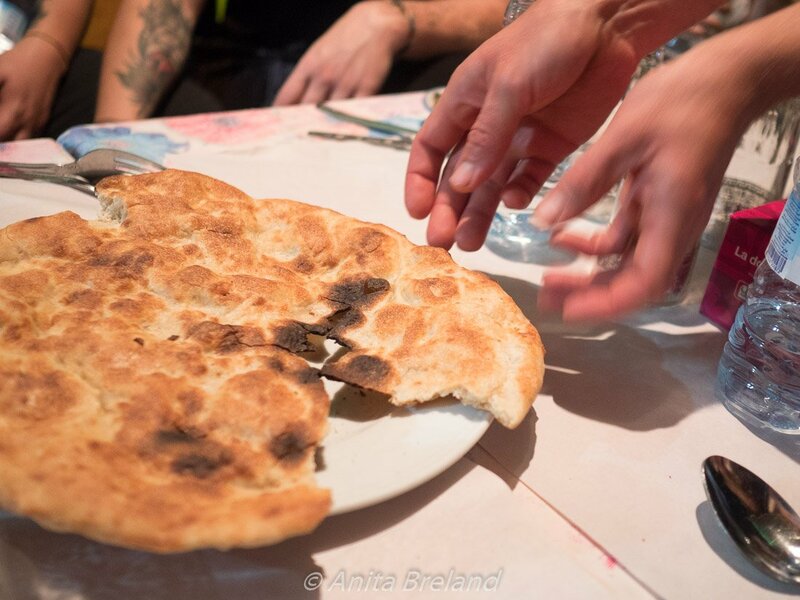 It was the best sort of food walk: every spot we visited has passed the test of time and local tastes and the food was guaranteed to be safely and authentically prepared. Some places open just a few hours each day, catering for locals at breakfast time, for mid-morning or late-afternoon snacks. Some are food carts serving seasonal fruits. In one case, a lunchtime restaurant opened in the evening just for our group. It was a well-curated mix of venues and flavors. We started the walk hungry, as instructed, and (just) managed to make it to the end without adjusting our belt buckles. 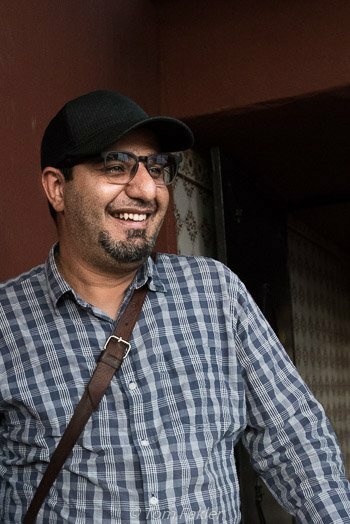 Youssef grew up here, and along the way, regaled us with stories behind the food we ate. 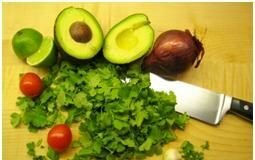 With his encouragement, I tried some things not generally on my list of must-eat foods…and I’m so glad I did! After many food tours over the years, Tom and I have a few ways we judge how well any given tour settles us into the local food scene. 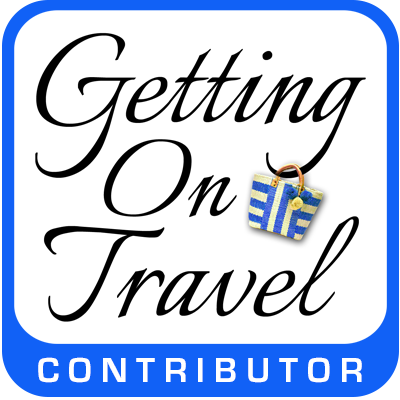 Is it a worthwhile experience for both first-time and repeat visitors? 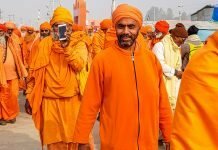 Does it cover the basics with flair? Does it offer a balance of familiar and more adventurous tastings? Does it highlight the most important aspects of local culture in an entertaining way and with plenty of background about the foods we sample? Our walk with Youssef satisfied on all counts, from basic flavors to Morocco’s signature couscous, from street-food adventures to a sweet finish. Moroccan cuisine takes pickled foods to a high art, and olives are among the best examples. There are the brined olives for cooking, in green, pink and black. There are the good-eating ones, herbed up with thyme, garlic, and harissa. And there are other pickled goodies, such as jalapeño-like peppers and preserved lemons. We tried them all! Lamb, grilled or baked or in tagines is Moroccan fine dining, and we sampled several preparations. There are just three of the traditional underground ovens, much like a tandoor, remaining in the Marrakech medina, and we had a chance to see them in operation. 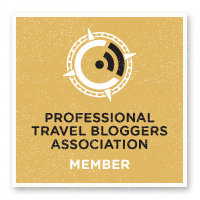 Tom liked the melchoi—char-grilled—and got his “I ate the eyeball” badge. The lamb tangia was my hands-down favorite, delicately redolent of herbs, and every bit as savory as the beef tangia we first tasted in Fez. 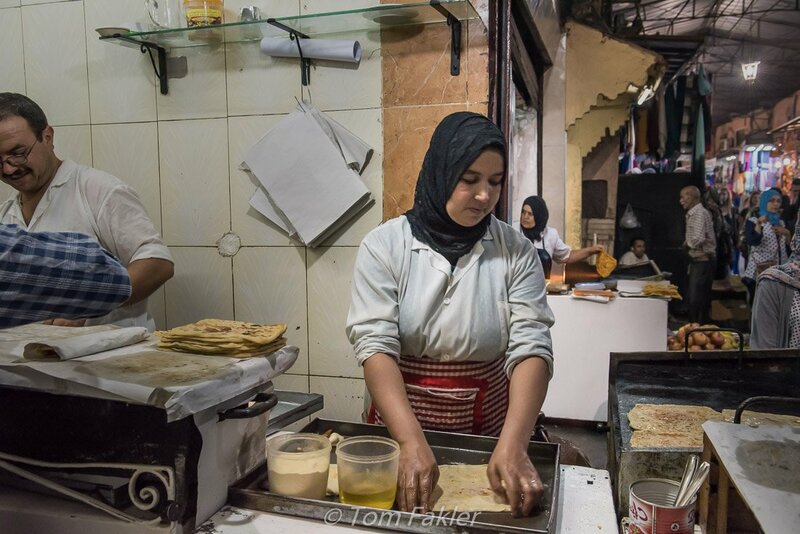 Msemmen omara—msemmen bread, the traditional, pancake-like bread of the Maghreb, stuffed with onions and spices—is Moroccan fast food, made while you watch, rolled and wrapped in paper. Mildly peppery and highly addictive! Snails farmed near Essaouira are tiny things, and in the Marrakech medina, served in little cups that befit their delicate stature. These juicy morsels get their zip from long-cooking in a broth flavored with anise. 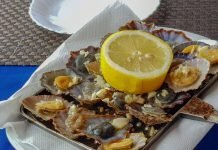 Plucked one by one from the shells with a toothpick, they were a delight. An extra: cups of the broth, passed around for a sip or two. I can just imagine how welcome this broth will be when the weather turns chilly. Spleen—and goodness know what other animal bits—chopped fine and grilled with plenty of herbs, is not something I would ever select from a restaurant menu. Served on a piece of foil, this grilled mixture is not picturesque food, but it was surprisingly tasty. Hout quari are grilled sardine meatball sandwiches made with a “secret” spice mix and served with smen (Moroccan preserved butter), olives, harissa, tomato sauce, and onions. 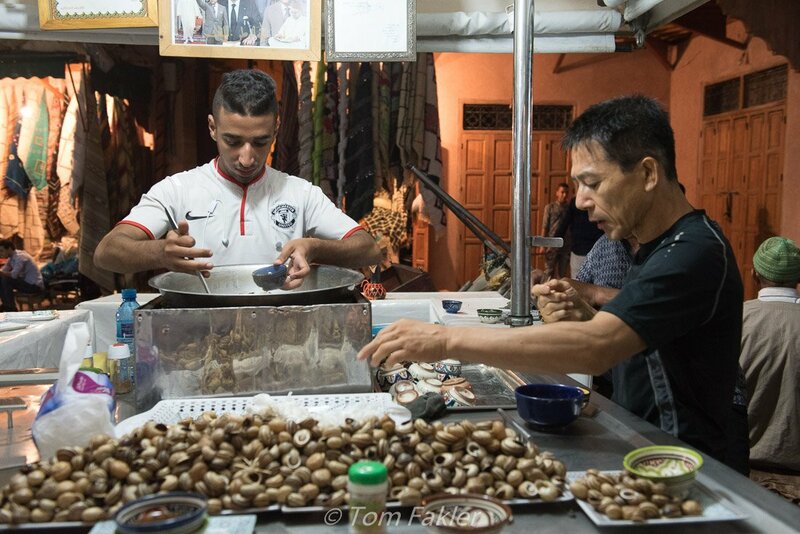 The heady blend of spice, butter, and tang sandwiched into a split single loaf of bread, then doused with a piquant sauce was a childhood favorite of Youssef’s, and now it is one of my favorite street foods, too! The vegetarian tagines served up in most restaurants are tepid affairs, and couscous can be right out of a box. 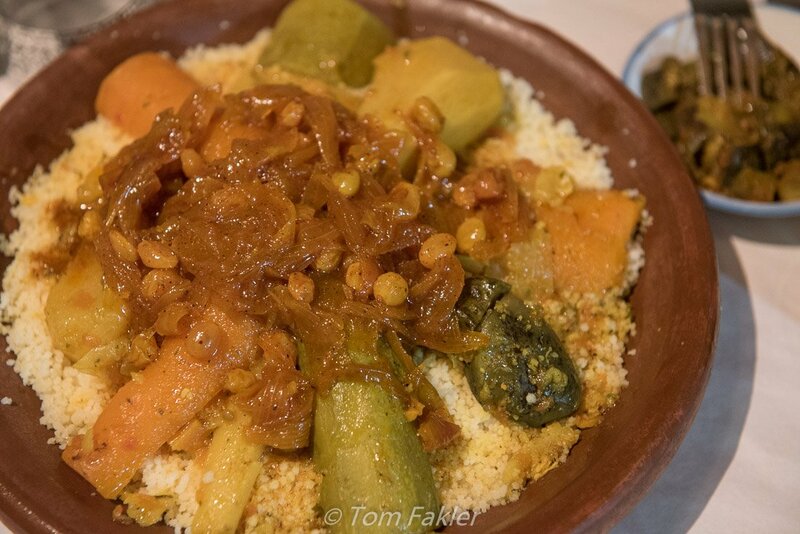 The couscous tfaya—vegetarian couscous with caramelized onions and sesame seeds—we enjoyed on our walk was none of this: instead, it was a four-hour love affair from a tiny hole-in-the-wall place in the back of beyond, prepared just for our visit. The couscous had been made in good Moroccan grandmother fashion, a sumptuous version for the Friday meal: steamed above vegetable broth, tossed in olive oil and steamed some more. The clincher was the topping of onions and sultanas, which added a yummy, not at all treacly, sweet note. Alongside the couscous, we were treated to freshly made tafernout (crispy flatbread) and mint tea enlivened with other herbs. Crisp tafernout is good with couscous, and, I imagine, just about anything! Moroccans are notoriously fond of sweet flavors, especially honey. Perhaps surprisingly, they generally serve fresh fruit to follow a filling repast. Our couscous meal ended with a refreshing jolt of fresh from pomegranates. 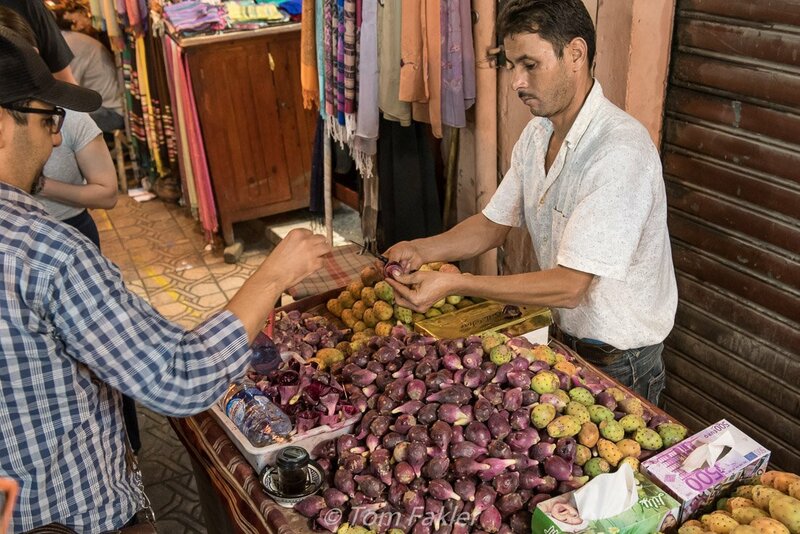 On our walk, we also had a chance to taste cactus fruit, piled high in seasonal profusion throughout the medina. Sfinge—Moroccan donuts—are a lot like their cousins, the beignet, only not as sweet. Rather like fried bread, they are handed over on brown paper and dipped in honey or dressed up with a dollop of jam. 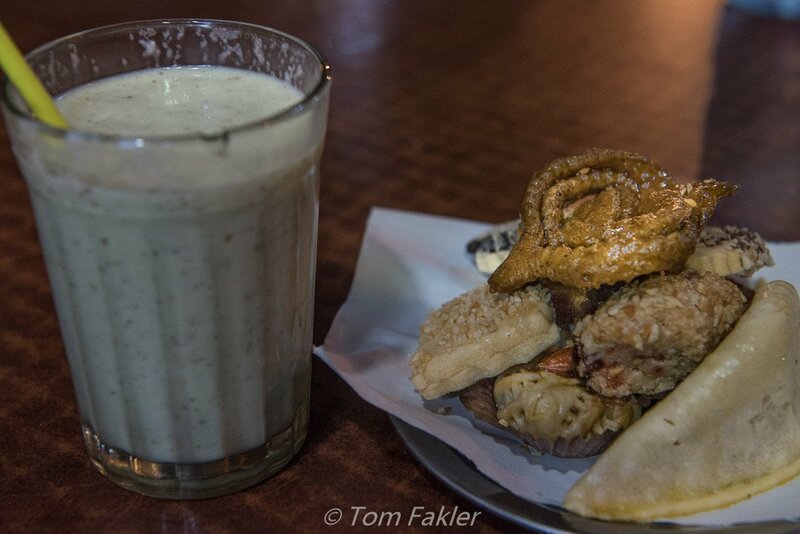 These sinful delights are especially popular with Moroccans as a morning bite or a nosh before dinner. A vendor strings sfinge onto a “rope” of palm fronds. One of the most popular Moroccan energy boosters—or simply a treat—is a fruit smoothie. My choice of soothing avocado and almond turned out to be just the thing to go with a little sampler of pastries: honey-soaked chbakiya (Ramadan cookies), kaab gazelle (moon-shaped almond cookies). 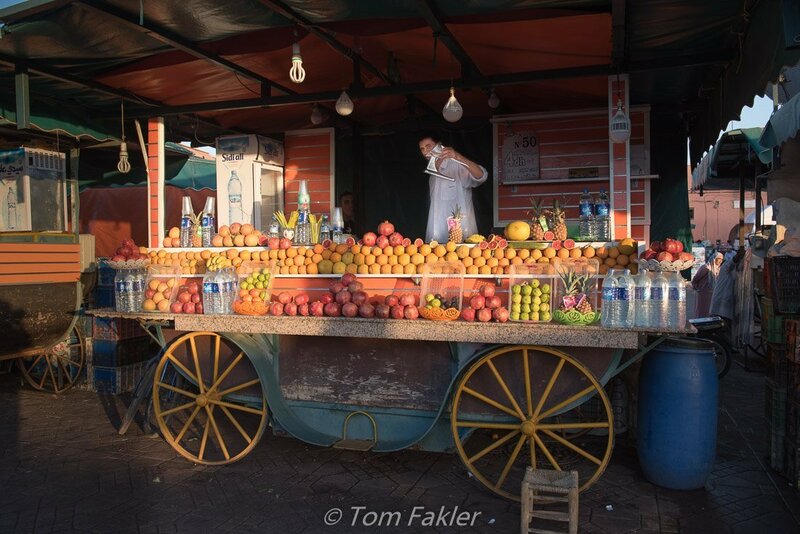 Fruit smoothie and pastries: a fine finish to our food fest in Marrakech! 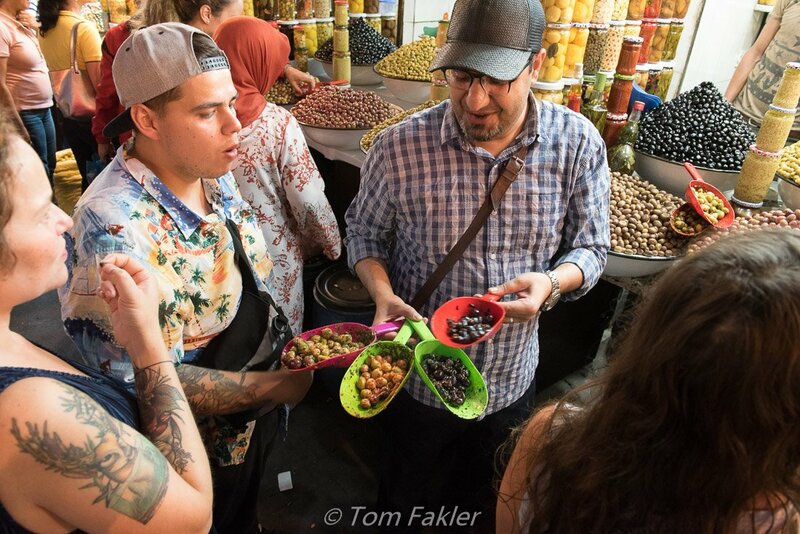 A walk with Marrakech Food Tours is the perfect time to trust someone else’ good instincts for food safety and authenticity, and just enjoy it! The range of foodie experiences on offer provides several slightly different takes on the city’s food scene and locations. 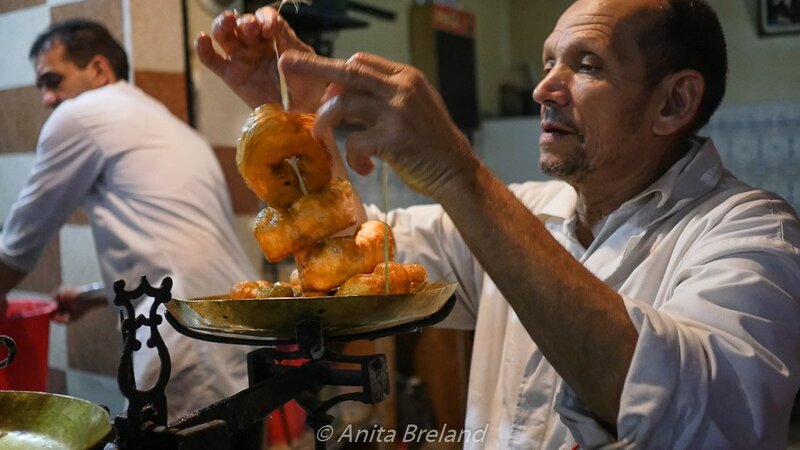 Our evening street food tour took us to carefully chosen places in the streets and back alleys of the medina, places we would never have found on our own. 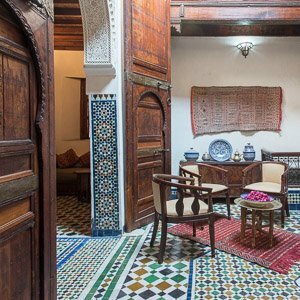 A gourmet tour takes participants to a progressive dinner with stops at a different riad for each course. A sandwich walk offers adventurous eaters discovery in the Kasbah and Mellah, two of the oldest neighborhoods in the city. It can be difficult to accommodate Moroccan foods to highly restricted diets or vegans. To avoid disappointment, ask up front about any dietary concerns. Thank you, Amanda and Youssef, for our delicious introduction to the food delights of the Marrakech medina…We savored every bite of our time with Marrakech Food Tours!